Went to six flags yesterday with my crazy, rollercoaster-obsessed friends. Every inch of my body is yelling at me right now due to the extreme thrashing it took on those machines of death. Note: El toro is not for the faint of heart. Never again. I repurchased raybans, this time in a model that fit my face better. Wayfarers truly are a staple. Planning on spending the day in this easy blouse + wayfarers while barbequeing poolside with family and friends. I love summer. Love your top, ruffles look always so classy!! I'm terrified of roller coasters! I'm impressed that you did it. A Ferris wheel is all I can handle. Anyway, that top is spectacular! I love the blouse! I have only once been on a roller coaster, and never want to again. That blouse is absolutely beautiful on you. And those sunglasses are tre` cool. Thank you for dropping by my blog. Please come again and I will do the same. That is an adorable blouse. I am currently saving up to purchase some ray-bans. They are the perfect sunglasses. And summer is great for BBQs and pool lounging. I love it! Raybans have proved their face-altering ability to me on too many occasions. maybe i just haven't found the right pair yet. Great top! You're a much braver woman than I am to go on all those coasters with your friends. never came across your blog before, but it's great, could we please link you?? Ruffles are HOT, always and forever. I especially like the first top you wore. Haha. Six Flags, sounds like my kinda place. I think that top is perfect for summer bbqs. super cool photos, love the top! 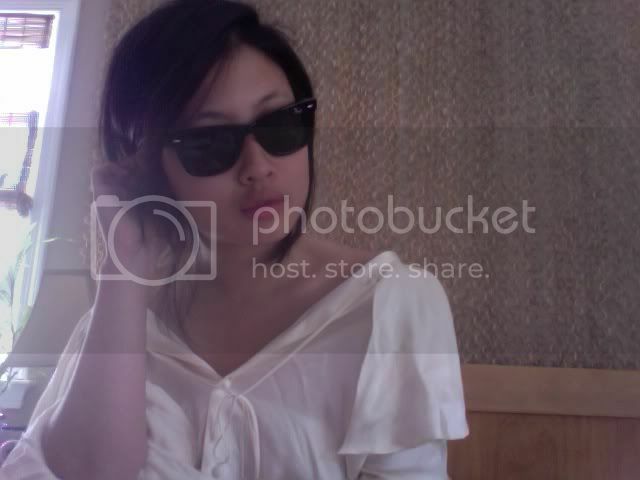 Blouse + Raybans = Amazing! You looks beautiful in this outfit.